It is sometimes claimed that the Imperial Japanese Navys 30mm Type 2 was a copy of the MK 108, but despite some similarities in the ammunition shape they have little in common. The Type 2, which seems to have been developed some time before the MK 108, is simply a scaled-up 20mm Oerlikon with the usual front-mounted recoil spring. It has a much longer barrel than the MK 108, which accounts for both its higher muzzle velocity and its necessarily lower rate of fire. If there is any relationship between the two weapons, it seems more likely that the Germans took the Japanese gun as a starting point for the development of the MK 108, altering the design to sacrifice muzzle velocity in order to achieve a higher rate of fire. projectile rather than in a separate cartridge case. This was not a new idea, having been tried in the American Volcanic repeating rifle of the mid-nineteenth century, but it was (as far as this author is aware) the only modern military application to see service. 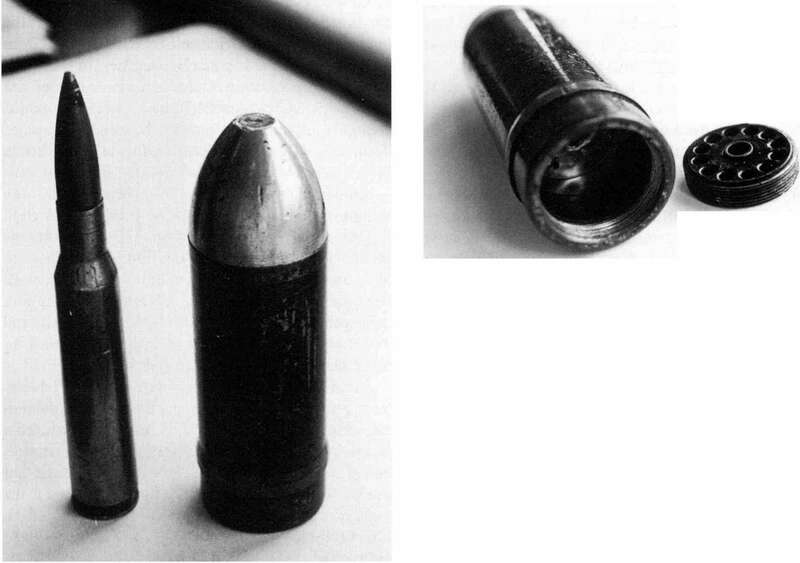 In appearance the Ho-301s cartridge resembled a small finless rocket, but it differed in principle in that the charge (expelled through twelve 3.8mm diameter holes in the base of the projectile, surrounding the primer) burned out within the barrel, generating a recoil thrust to drive the blowback mechanism. The projectile was 13.5cm long, of which the rear 3cm was devoted to propellant. However, the gun was not successful and saw little use. light automatic grenade launchers which have emerged in recent decades.